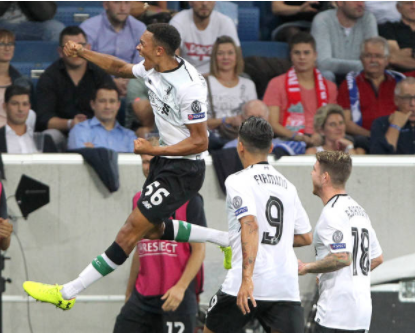 Liverpool had an impressive night as they beat Hoffenheim 2- 1 in a match played Tuesday 15 August, 2017 at Rhein-Neckar-Arena in Germany. This was the first leg of their Champions League play-off round clash. Liverpool’s win was inspired by James Milner’s and rookie Trent Alexander-Arnold’s goals. The match was not balanced as the English team was overpowering the Germany outfit most of the night. Liverpool’s goalkeeper Simon Mignolet saved a poorly taken penalty kick by forward Andrej Kramaric. Did you know that you can place your bets on your favorite soccer player at any online casino ca and win great bonuses. Trent Alexander-Arnold punished Hoffenheim for their earlier mistake with a cracker 30-yard free-kick. He curled the ball over the wall into right bottom corner in the 35th minute. Liverpool kept on searching for a second goal and their efforts paid off in the 74th minute. The goal was courtesy of Havard Nordtveit who deflected James Milner’s cross into the back of his own net. Hoffenheim’s coach Julian Nagelsmann brought in fresh legs through a substitute Mark Uth and he pulled one back for his team in the 87th minute. The match could have ended up in a stalemate. However, Hoffenheim’s Benjamin Hubner missed a perfect chance to level matters as he missed a free header from close range. Minutes later Hoffenheim nearly equalized as former Arsenal forward Gnabry was denied by Liverpool’s stopper Mignolet and Sandro struck the woodwork from the rebound. In the dying minutes, Liverpool should have scored another goal but Hoffenheim’s goalkeeper Oliver Baumann had other thoughts for Sadio Mane’s effort. The man of the match title belonged to Trent Alexander-Arnold who scored the brilliant free-kick. It was his ninth start as a Liverpool player in all competitions. Liverpool’s manager Jurgen Klopp was impressed with the performance of his team as they were triumphant in the backyard of their opponent. Liverpool has a two goal advantage ahead of the second leg Champions League playoff match to be played at Anfield on 23 August 2017. This entry was posted in Previous Posts on 19/08/2017 by leighc10.